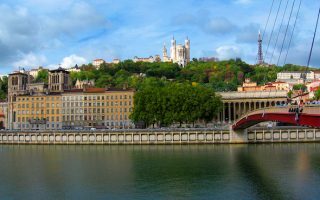 This is our guide to running in Lyon, second largest city in France, and a UNESCO World Heritage Site known for its cuisine, architecture, and unique geography. The Rhône and Saône Rivers converge to the south of the city center, forming a peninsula called “Presqu’île”. 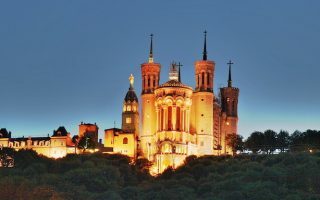 The original medieval city, ‘vieux Lyon’, was built on the west side of the Saône, at the foot of the Fourvière hill, on top of which sits the grand basilica of Notre-Dame de Fourvière. 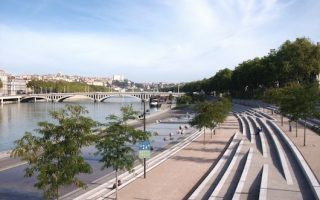 The best places to run in Lyon center on the two rivers, where numerous bridges allow for loops, even using Presqu’île to connect the two. For the Rhône, the best running is on east side, between Gerland Park and Parc de la Tête d’Or, while on the Saône there are good paths along both sides. We’ve mapped out a great ‘runseeing’ tour, incorporating many important Lyon sites and a climb up Fourvière. Runners who like hills and stairs will love Lyon! 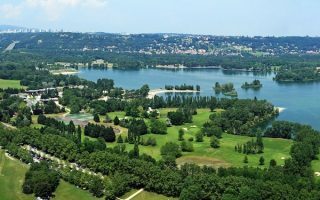 Other great runs in Lyon are the paths around the Parc de la Tête d’Or, one of the largest urban parks in Europe, and the Grand Parc Miribel Jonage, where the running highlight is the 10k lake loop. Lyon is an easy city to get around. There are 4 metro lines and 5 tram lines, buses, and two funicular lines from Vieux Lyon to Saint-Just and Fourvière. A 10 km 'runseeing' tour of Lyon, incorporating many important sites and buildings, including Vieux Lyon. A highlight is the climb up the Fourvière to the Basilique Notre Dame. After a nice downhill, enjoy a stretch along the Saône River. 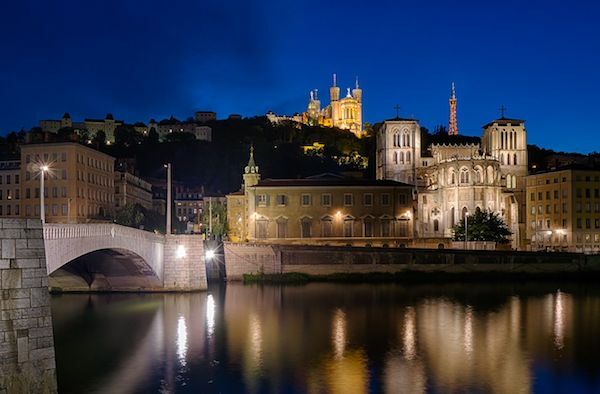 A classic European river run and one of the better, seamless spots to run in Lyon. The best running is along the east side of the river, between Gerland Park and Parc de la Tête d'Or, 8.6 km. Dedicated path most of the way, good loop options. 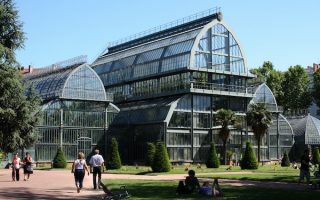 One of the largest urban parks in Europe, and designed on a grand style -- fountains, statues, botanical garden, and many lovely paths and allées. There's a 4 km perimeter 'jogging path', or many other interior paths for a DIY run. Lovely run along one of Lyon's two rivers. There are good paths on both sides of the Saône, from the confluence in the south, through Vieux Lyon, to Pont du Maréchal Koenig, 6.3 km one-way. We've included a table with segment distances. Wonderful park for running, about 10 km east of central Lyon. The running centerpiece is a 10km marked loop around the lake. There are additional spots for running along on some of the park's popular bike paths. Lyon has a humid subtropical climate, with some oceanic influences. Summers are warm and humid, with average high temperatures of 27C (81F) and warm but not hot nights. Average winter highs temps are 7C (mid-40s), and lows average around freezing. There can be ice and snow in Lyon, so plan for that. The 831mm (32 inches) of precipitation is fairly evenly spread through the year. Lyon is a popular tourist and business city, so there’s a good selection of centrally located hotels. There are many hotels in and near Vieux Lyon, on Presqu’île, and fewer on the eastern side of the Rhône. For the best running in Lyon, try to stay within a km of the rivers. Terre de Running. Centrally located, on the rue de la Barre, near the metro. Lepape. Metro Cordeliers on Presqu’île. Run and bike shop. Run in Lyon. Early October. The signature annual running event in Lyon, attracting nearly 30,000 runners for a 10k, half marathon, and full marathon.